The Okavango Delta is an amazing and impressive wildlife area in Botswana. This lush, tranquil and beautiful area is one of the most well known destinations in Botswana, and when the Okavango plains flood during May, the delta becomes a focal point for a huge range of wildlife, so if you are a fan of big game you will find this to be an incredible destination. This look at the top 5 Camps Okavango Delta visitors enjoy will help you to find the best places to stay – whether you enjoy luxurious camping or want something a little more ‘authentic’ but still with the main home comforts, you will find somewhere in the Okavango Delta that you will enjoy. The Okavango Delta is the ultimate destination on any luxury Botswana Safari. The Jao camp is one oaf the most luxurious and hip camps in the region. It features 9 rooms, and is a wonderful hideaway that you can use as a home base while you explore the lagoons, floodplains and grasslands around the delta. These luxurious accommodations are very close to the Moremi game reserve, which is home to buffalo, elephants, a huge range of birds, and many other animals. The nine rooms are all incredibly spacious and feature thatched roofs and beautiful decor. They are elevated from the ground for warmth and comfort, and offer panoramic views of the surrounding plains. Each room has a double vanity and an en-suite bath, as well as an outdoor shower. The furniture is luxurious and would not look out of place in a more traditional city hotel. If you want a luxury camping experience that includes everything from a massage therapist to a wine cellar, then this is the perfect camp for you. Mombo camp is the ideal destination for anyone who wants to really get up close and personal with the animals in Botswana. There are two safari game drives each day, and it is not unheard of for animals to actually wander right through the camp itself. The landscape is beautiful, and the tent suites are constructed so that they stand six feet above the ground – so that you’re safe and protected from those wandering animals. You can expect to see buffalo, elephants, rhinos and dingoes and even giraffes in the nearby area. Each of the nine suites is beautifully equipped and presented. The camp has a living area and a dining room in addition to the dedicated tends, as well as a plunge pool and a pub – so you can be confident that you’ll enjoy your favorite home comforts while you relax in the camp, and look out over the delta to enjoy an amazing view. This twelve room camp is named after Chief Moremi, who is the ‘king’ of the area, and who once used the lands as a hunting grounds. The camp is located on an island which is created by Okavango’s seasonal floodwaters, and that is known as Africa’s predator capital. It is home to several large herds of elephants and buffalos and there are several hundred species of bird that also pass through the area. The camp features a well equipped lounge and dining area, a fire pit for atmospheric evening relaxation, and a beautiful view of the floodplains, so you can relax and keep on watching game in the evenings. There are 12 secluded pavilions, each of which is luxuriously furnished. The split-level main deck area boasts a nice viewing area as well as a swimming pool on the lower deck. Visitors can also enjoy a relaxing spa treatment in the special treatment room which offers amazing views, and there are many activity options – including helicopter tours of the delta and floodways, and game drives. The Abu camp is a relatively small, classical camp that offers incredible luxury, being a home away from home in the Okavango Delta. Featuring just 6 suites, this high-end camp lets visitors enjoy a range of activities, including elephant tours of the delta. Visitors can enjoy watching elephants while chilling out by the camp fire, sip a gin and tonic on the camp’s deck, and relax in a tent that has been decorated in Afro-Bedouin style. The tents feature en-suite showers and baths, and there’s a swimming pool too, as well as a well-stocked bar, so there’s no shortage of opportunities to indulge yourself while you sit and watch the passing wildlife. After an evening of indulgence, you can head out on a guided walk, go on a mokoro safari, or head out for a night drive. The options are endless. Ending our Top 5 Camps Okavango Delta visitors enjoy is the Sandibe Okavango Safari Lodge, which is a little more affordably priced than some of the others, but still an extraordinary lodge. The camp has eight suites, and is a classic safari camp with a dose of luxury. It is well-equipped, tranquil, and the perfect place to enjoy the untamed beauty of the delta. Babboons and birds surround the area, ready to entertain people first thing in the morning. There are expert guides attached to the camp, so you can head out on a safari whenever you wish. The thatched cottages stand in leafy clearings that are conveniently close to the waterways of the delta. The outer appearance of the camp is subtle, and animals often wander by, undisturbed by the nature of the ‘building’s nearby. There’s plenty to do – safari drives, bush walks, suburb service, and cruises, for example. There’s a gin shop, laundry service, outdoor swimming pool and plenty of other amenities, so you’ll not feel too far from home, even as you get close to nature. This concludes the list of Top 5 Camps Okavango Delta holidaymakers love. There are many other camps to choose from that only just missed out on the Top 5 Camps Okavango delta list, so if the place you’re considering isn’t included, don’t panic – read some impartial reviews and make your own mind up. There is no shortage of great camp accommodation in Botswana, so you can be confident that you’ll have a great time wherever you choose to stay. 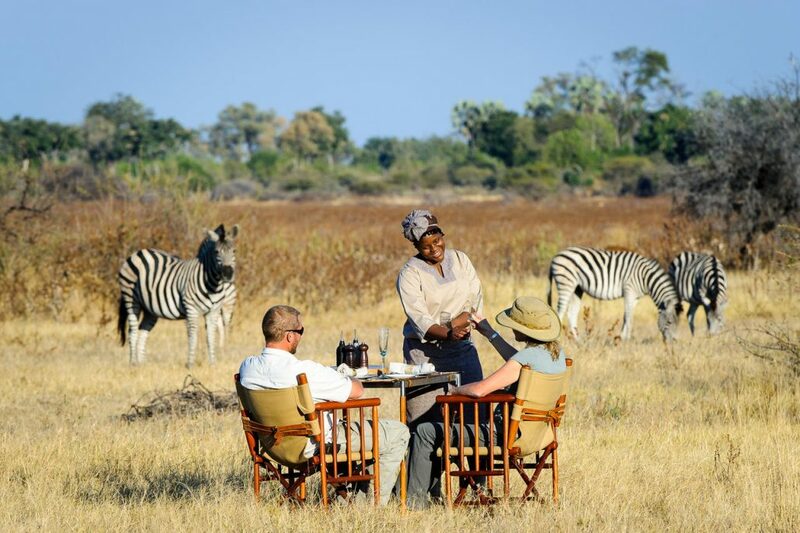 Each private reserve is open only to the residents and their guests, this is not some ‘public safari ground’ crowded with travellers – it’s somewhere that you can get truly close to nature; unspoilt, incredible, and exclusive. This is your chance to enjoy game in their own habitat, something that you will struggle to find in other parts of the world – and even in other areas of Africa, where tourism is (for better or worse) more open, and the endless streams of visitors have made the animals more nervous and camera-shy.